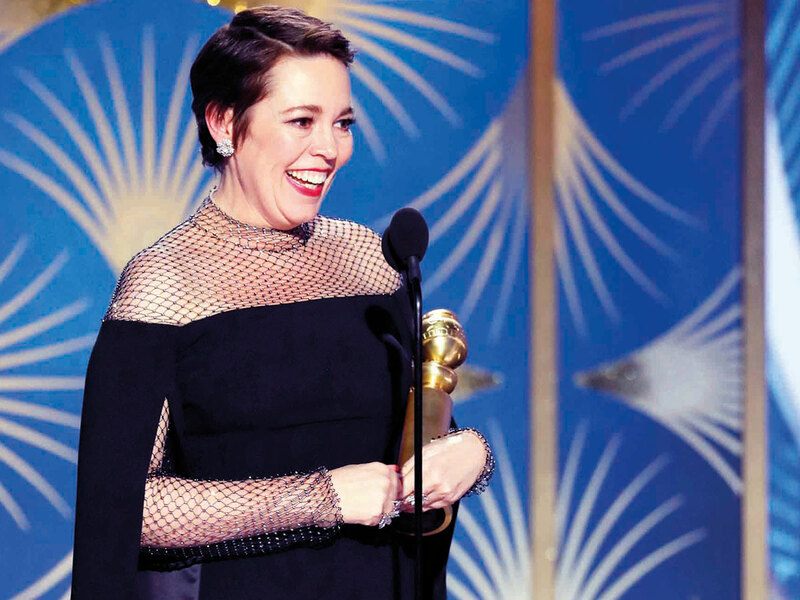 Olivia Colman’s victory at this year’s Golden Globes ceremony felt less like a lucky break than a long-awaited coronation — perhaps aptly enough, since she won for playing a queen. Yet as recently as six months ago few would have imagined she would be next in line for the Best Actress throne. Let’s take it as read that the Bafta is in the bag: her biggest rival at the Oscars next month is likely to be Glenn Close, her fellow Globe-winner at the weekend, and six-time former Academy Award nominee. Close started promoting her attention-grabbing turn in ‘The Wife’ with a silky smooth publicity tour last summer, at around the same time that Colman was appearing on Channel 5 as the voice of Marion the steam shovel in the latest series of ‘Thomas the Tank Engine’. Yet it is Colman’s performance as the beleaguered Queen Anne in Yorgos Lanthimos’s crackpot royal farce ‘The Favourite’ that has seen the 44-year-old Norwich-born actress elbow herself — albeit apologetically, in the classic British manner — to the front of the awards season pack. So why has this happened? And more to the point, how on earth did she become a sure bet? Colman’s profile as an actress is notable for its lack of glamour and pretence. No matter how many podiums she gets called up to, she always looks like a competition winner, or someone’s sister collecting the prize on their behalf. (She began her Globes acceptance speech with “Cor, blimey.”) Some in the industry have started to wonder if this is a carefully tended persona, designed to preserve her down-to-earth appeal and persuade casting directors that she hasn’t gone all Hollywood. But those who have worked with her insist this is what she is like: socially awkward and self-effacing to a fault, without any great ambitions beyond pursuing roles that pique her interest. When you compare her early career to, say, Kate Winslet’s — both British actresses in their early 40s to have crossed the Oscar radar — there is no obvious battle plan. A former member of the Cambridge Footlights, Colman spent her 20s pottering in radio and television comedy, and came to prominence in ‘Peep Show’, in which she appeared for 12 years as Sophie Chapman, the sometime love interest of the comprehensively hapless Mark Corrigan (David Mitchell). As sitcom roles go, Sophie was thrillingly messy and complex. Far from being the show’s calm feminine centre, she was sweet and pitiable one moment and petty, shrewish and manipulative the next: the opposite of the strong woman cliche, and all the funnier and more interesting for it. Much as Colman projects modest likeability in person, she’s fearless in allowing her characters to be absolute wrecks. No less a figure than Meryl Streep spotted her potential during the making of her Margaret Thatcher biopic ‘The Iron Lady’ (2011), in which Colman played Carol, her daughter: when Streep collected her Best Actress Bafta that year, she made a point of describing her younger co-star as “divinely gifted”. Streep may have been thinking of Colman’s soul-wrenching performance that same year in the domestic violence drama ‘Tyrannosaur’, which had controversially missed out on a Bafta nomination, rekindling old complaints about the British Academy’s blindness to rising home-grown talent. Colman has, of course, been busy since then in both cinema and on television, where her role as Det Sgt Ellie Miller in ‘Broadchurch’ established her in the public mind as a serious actress. But another truly juicy film role didn’t present itself until ‘The Favourite’ — which might partly explain why critics and awards bodies are falling over themselves to honour it. The notion of it being “someone’s time” is a recent development in the film awards racket, and Colman’s fame is of a peculiarly old-fashioned type. Rather than beaming down once a year with a new tour de force for the world’s delectation, she just keeps plugging away in high and low-profile roles, and is at the very least worth watching in anything she does. Of course, Colman lacks those three actresses’ extensive stage experience, and has said that she finds Shakespeare “terrifying” — a fear it would be satisfying to see her confront some time soon. Colman may well go on to become an Oscar-night regular, though she strikes me more as a dame in the making; someone whose place in our culture depends more on the strength of the public’s affection and admiration than the specifics of her CV. The fact that her next major role is Queen Elizabeth II in the forthcoming season of ‘The Crown’ is almost too perfect. “And the winner is...?” More like “All hail”. The Favourite releases in the UAE on February 21. The Oscars will be held on February 25.